The Double Life of "El Cochiloco". In the late 80s a stranger arrived to the village of Coquimatlan, Colima. He bought lands around town, specifically outside of town, and built an impressive ranch. He named it Rancho Jayamita. He built a modest two story home. Nothing ostentatious. His name was Pedro Orozco Garcia. Don Pedro was a successful engineer who owned construction companies in the city of Guadalajara, capital of neighboring Jalisco state. His second floor bedroom had a huge window that wrapped around the whole room giving him a panoramic view of Jayamita. Access to the room, was through a narrow staircase that could be navegated one person at a time. His visitors thought of this to be odd. Nevertheless they liked Don Pedro. Tall, fair, blonde, blue eyed, mustachioed and wearing smart glasses, he hosted parties at the ranch with Coquimatlan mayor and the governor of Colima as guests. 300 plus guests often wined and dined at his ranch where he regaled the guests with horse shows, where he would personally ride his white horse, El Colimote. During town fairs and parades he presided, riding his horse and performing tricks. The mysterious generous rancher was beloved by the town. He gave away presents to the needy children and donated money to the town for public works. The Governor of Colima gave Pedro Orozco Garcia the title of "Benefactor of the State of Colima" for his phlanthropic ways. So when in the fall of 1991, Don Pedro Orozco Garcia was ambushed and savagely murdered on a congested Guadalajara street, the town of Coquimatlan was shocked. Who would want to kill Don Pedro? A generous rancher with no enemies? Thats why the entire town of Coquimatlan and the state of Colima was shocked to learn that Pedro Orozco was no engineer, nor a rancher. His name wasnt even Pedro Orozco Garcia. He was Manuel Salcido Uzueta, "El Cochiloco". 42 year old Sinaloan from the village of San Juan, and boss of the Guadalajara Cartel. Lord of the Mazatlan and Guadalajara underworld and king of the drug trade. Manuel Salcido Uzueta was born in the village of San Juan, Sinaloa in the 40's. As a child his mother nicknamed him "Cochi Loco", Sinaloan slang for "Crazy Pig" because he often ran around hyperactive like a mad piglet. He began selling marijuana then quickly ascended to pistolero for local mafiosos then through friendships forged with fellow Sinaloans, he became a top capo. He worked alongside famous drug barons as Miguel Felix, Rafael Caro Quintero and Ernesto Fonseca. He became a top lieutenant of the Guadalajara Cartel in the 70's and 80s' and established himself in the resort city of Mazatlan. There among the tourists and shady palm trees of Mazatlan he owned hotels, restaurants, movie theaters and night clubs. In Guadalajara he owned several Sinaloa style seafood restaurants, factories, hotels and car dealerships. He was a fair man to his friends but brutal to his enemies or anyone who crossed him. Bloodthirsty and ruthless was he, true to his nickname of "Crazy Pig". One time, one of Salcido's pistoleros failed to do a job. Facing down the barrel of Salcidos gun, he managed to crack one last joke before being blasted. He told Salcido "Boss, just slap me one or twice and ill learn. It will never happen again". The pistolero was lucky. Salcido cracked a smile and lowered his gun. He spared his pistoleros life. In 1991, a boat moored at the port of Manzanillo, Colima was raided by the federales. The boat, the Chimborazo had come from Colombia and was destined for Long Beach, California. The federales found 3 tons of cocaine on the boat. The owners of the boat in Colombia were irate. They were the Medellin Cartel. Another thing. The boat was carrying EIGHT tons of cocaine not three. Where had the other five tons gone? The blame was placed on Manuel Salcido Uzueta. Colima was his turf. He had to answer to the Chimborazo fiasco. On October 9, 1991, during one of his weekly trips to Guadalajara from Coquimatlan, he was riding his white Ram Charger. His sidekick and driver, a Judicial Police officer named Obeso drove and his 20 year old daughter Monica was also riding in the truck. At a red stop light on Avenida Obsidiana in the posh Residencial Victoria section of Guadalajara two cars, a Buick Century and a Mercury Topaz intercepted them, blocking their path Two men riding on motorcycles also rode up to Salcidos truck. Eight men descended from the bikes and cars, and pointed their AK-47's, AR-15s and Galil assault rifles at the vehicle. Salcido, knowing what was about to happen, took out a hand grenade and attempted one last time to fend of the hitmen. He didnt get to pull the pin and toss it at them. The eight men unleashed a fusilade of bullets at Salcido and his truck. Manuel Salcido Uzueta "El Cochiloco" was shot 85 times. His daughter was shot 15 times but managed to live. Obeso's body received 30 hits. Thats how the criminal career of mysterious engineer from Coquimatlan ended. Pedro Orozco died ripped apart in a hail of bullets on a Guadalajara street. And the people of Coquimatlan were shocked to learn their mysterious benefactor, neighbor and friend was none other than the ruthless and feared "Cochiloco". Manuel Salcido Uzeta was buried in a crypt in his native San Juan with his guns, AK-47, favorite cowboy boots and jewelry in a funeral attended by most of Sinaloa's top capos. 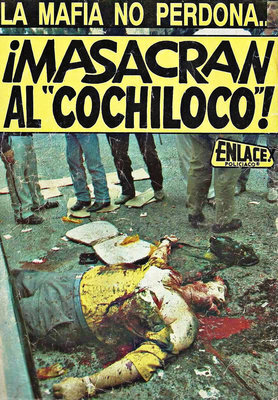 The bloody and mangled body of Manuel Salcido Uzueta graces the cover of a Guadalajara crime tabloid magazine after his assasination on October 9, 1991. The headline reads: "The Mafia does not forgive: El Cochiloco is massacred !"